Let's talk about Mr Fudge, baby. Let's talk about Thomas J. Let's talk about biscuits for cheese, a many-shaped miscellany. 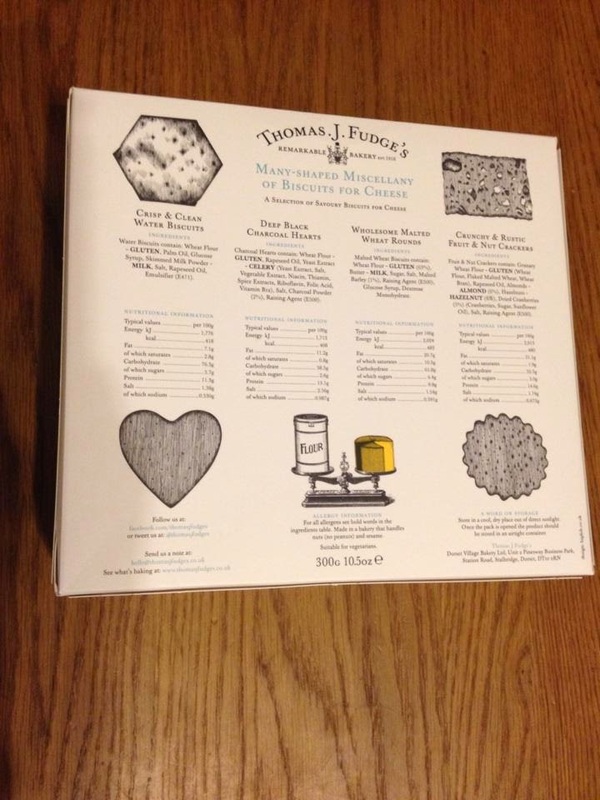 Now me and Neil have sampled Thomas J. Fudge's delights before, but for those of you who haven't encountered his products let me explain. It's all crackers. Well. It's crackers, shards, biscuits, melts and more. In fact, anything you would want to side with a bit of cheese, or maybe a saucy dip, and get out at the end of a successful dinner party. The many-shaped miscellany can be considered a bit of a sampler; it's the ideal size for four-to-eight people to share at the end of a meal with cheese and it gives you an idea of what some of these crackery delights are like - maybe leading to future biscuity excursions into other tantalising areas - ooh the temptation! 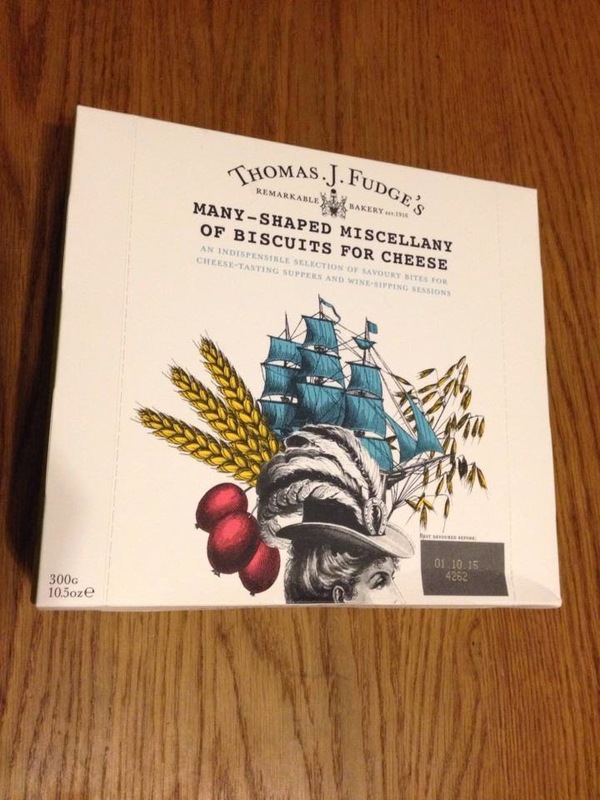 There are four of the popular, or traditional biscuits for cheese cracker things (I might be running out of synonyms here) in this 300g box (RRP £4.50). We have your traditional "crisp and clean water biscuit", "Wholesome malted wheat rounds", "deep black charcoal hearts" and "crunchy and rustic fruit and nut crackers". Taking each in turn, the water biscuits are exactly what you'd expect. They are more subtly flavoured, crisp and thin. The Malted wheat rounds are similar (but more than a little tastier) to the "digestive-y" style of biscuits you often get in "biscuits for cheese" selection boxes. The crunchy and rustic fruit and nut crackers are exactly that. They ooze flavour and are really quite a nice complement to your favourite strong cheese. Our favourites (because I did share with Neil) were the charcoal hearts which were thin, very crispy, and quite a unique flavour which worked well with all the cheese we tried with them. All in all it is an ideal thing to have for any dinner-party. It is a good selection, reasonably priced and definitely recommended. Although, don't stop there - all the biscuits and crackers on the site are just as tasty. Well worth a perusal, a purchase and a (word beginning with p that means eating). Also - before I forget. WE LOVE THE ART ON THE PACKAGING! Really (sorry about shouting). 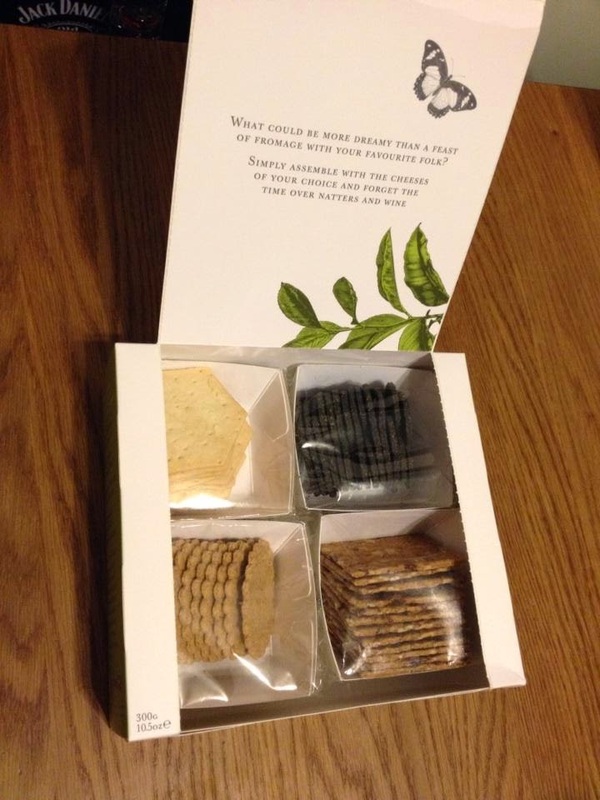 It is really cool and unique and gives the crackers a feel that you're getting something special - before you've even opened the box! I love crackers and cheese, and I'd love to try the charcoal hearts! They look delicious and the packaging is so pretty.